In the company of Marianne and Ron Ignace, the slopes of Skedam Flats and Mt Lolo ring with a history that bears witness to a continual interaction of plants and people. 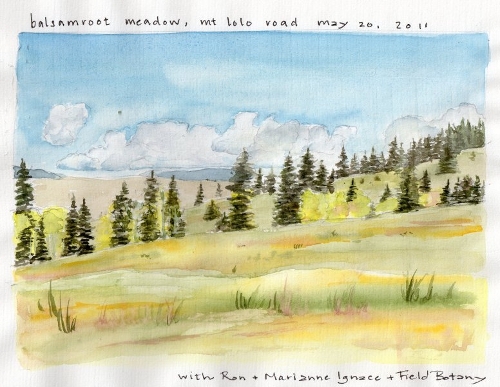 At the entrance to the flats, Marianne and Ron lead us to the depressed walls of a historic pit oven and then we head to higher ground to wander in one of the most spectacular balsamroot meadows I have visited. Cadmium yellow spills across the slope while the rich chocolate of rice root (Fritillaria lanceolata) lies hidden in the swale mid field. When we turn downhill once more, I keep thinking about “gardening in the wild”. But even the word “wild” is wrong as it implies a lack of people and this morning has reminded me again of the continual presence of people in this valley for the last several thousands of years. Botany Pond–A visit with the Field Botany class to the NCC property in Lac Du Bois brings with it a sense of abundance. 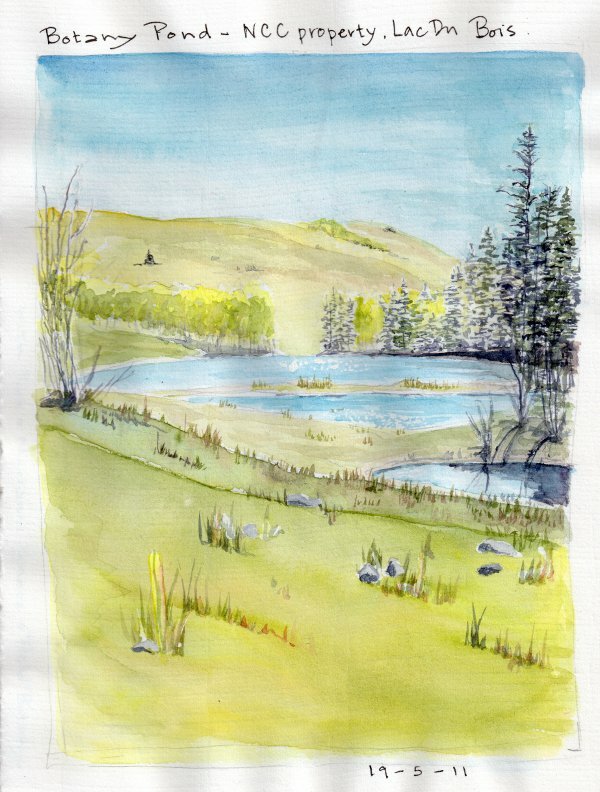 Sandhill cranes call in the near-distance, meadowlarks trill and ducks swim on the pond. We climb the hill to the largest aspen stand I’ve found in these upper grasslands. Near the top, the students spread out to sketch rolling landscape. This is my favorite place in these grasslands. Each time I visit, I feel bequeathed with natural history moments to treasure. I lose track of time completely (my wind-up watch running down completely) and it is not until Christine reminds me that it is nearly noon that I face leaving this oasis of diversity. As we head down the old, grown over road, I look back to catch a glimpse of the pond(s) shimmering in the sunlight. Back in my office, surround by the trappings (encumberances) of an academic life, I rest easier knowing that that there is a calm spot of quiet up in the hills.